Regine’s blog about living with Leukemia gained a huge following, and eventually became this book. She writes openly about emotional and physical aspects of her 15-month struggle to recover, and explains how her disease impacts her life. In the course of her illness, Regine has photography exhibits, goes to concerts, enjoys her friends & family, and advocates for registering as a blood and bone marrow donor. She was a typical teenager with an amazing will to live; and the lessons she learned have relevance for all of us. Wow! How does one review a book that was so very, truly real. My usual reviews consist of a break down of Characters, story building, writing style, etc. But Regine's Book was no story of fiction. This was reality. There are no characters or story building just real life. 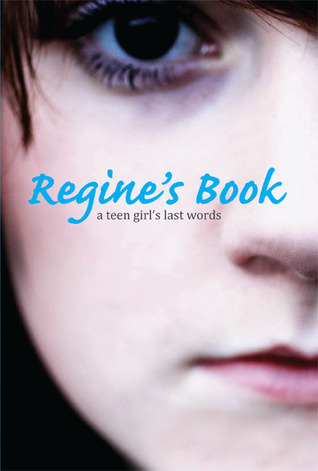 In this heart-breaking yet beautiful memoir, we are introduced to Regine, a normal teenage girl with the world ahead of her who just found out she has an aggressive form of Leukemia. She takes to the blogging community to vent, to understand, to explain and to educate what life is like living with Cancer. It is impossible to read this book without experiencing a flood of emotions. Regine did something that I will forever be thankful for; She took me on that journey with her. She opened my eyes and showed me so much, and gave me a new perspective on life after a diagnoses. This book is simply one that must be experienced solely by the reader. No amount of words or explanation can give you a full understanding of what this book holds unless you read it for yourself. Regine turned to the blogging community to help her through some of her darkest times along with some of her brightest moments. As bloggers, we can pay Regine back by sharing her story with others. With the season of giving in full swing, Regine's Book would make a wonderful gift. No matter what unfortunate hand you've been dealt, you and Regine can face it together. You are not alone! To learn more about Regine's Book and other fabulous non-fiction titles, check out Zest Books! It sounds great, but so depressing! Did it make yo weep your eyeballs out? Yes! It did! It is heavy but oh so lovely as well. It shouldn't be missed! Hi! I'm a fellow blog tour stop for Regine's Book (my post goes up on Friday)! I thought Regine's raw honesty - while overwhelming at times - helped to put so many things into perspective. It was definitely tough for me, due to personal experiences with cancer, but it's well worth taking the time to read and share with others. I'm a big advocate for raising money for cancer and also just started a team on StandUp2Cancer.org - StandUp4Ohana is my team name, Ohana meaning family in Hawaiian (FYI, 100% of all donations goes straight to the cause through this organization). This year for Christmas, I donated money for all of my siblings in memory of our Mom and bought them t-shirts through the site. Such a good cause and money well spent! Great post - so glad to be a part of this blog tour with you!